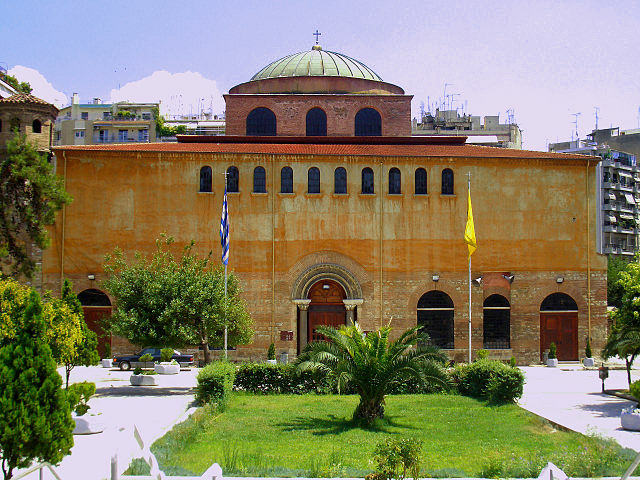 The cultural capital of Greece, Thessaloniki, is the final city visited by the Great Balkan Ride. The minimal assistance rally will depart from Sarajevo, traversing Montenegro, Kosovo and Albania, before reaching Greece. Teams can celebrate the end of the adventure in the beach paradise of Nea Kalikratia, not far from the city. What makes Thessaloniki special is that it offers everything you could possibly want from a city break. You can relax in the sun, eat till your heart’s content, or party all night long. That’s not all: Thessaloniki is packed with history, art, and culture. Here’s what makes Thessaloniki special. Thessaloniki has been around for a long time, well over two thousand years, and you can tell. History surrounds you as you walk the streets. All over the city there are ancient remains, with more being discovered all the time: look around (and down!) as you walk, and you might see live excavations. You don’t need go to a museum to get a sense of the city’s long history, important sights are everywhere. You will inevitably pass the imposing Church of Hagios Demetrios, constructed in the 7th Century. And while the Hagia Sophia isn’t quite as impressive as its Istanbul namesake, the church (and former mosque) is still pretty impressive considering it was built in the 8th Century. Not far away are two even older relics: the Arch of Galerious and the nearby Rotunda date from the early 4th Century. They used to be linked as part of a grand imperial complex: admire the arch’s intricate engravings and ponder Thessaloniki’s Roman past. Even better, some of the historical monuments that make Thessaloniki special offer impressive views. 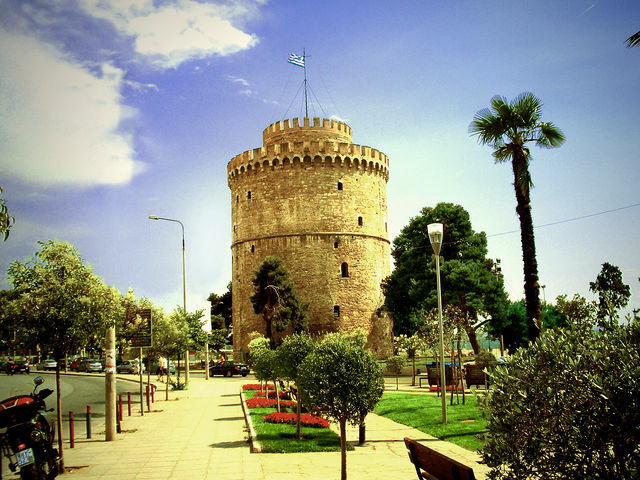 The most recognisable monument in town in the White Tower, the symbol of Thessaloniki, which has pride of place on the city’s waterfront. It’s almost 1000 years old, and has served as a prison and fort. Now it makes a more than serviceable viewing platform. The bloody tortures that took place within its stone walls meant it was formerly called the Red Tower, only earning its current name when symbolically whitewashed after being freed from Ottoman power in 1912. For an even more impressive vista, look over the whole city from Ano Poli (Upper Town), nearby the old city walls. This was the only area of Thessaloniki undamaged by a great fire in 1917; cobbled streets and old square give the area a very authentic vibe. Thessaloniki is Greece’s cultural capital, and there is a lot to see. A modern highlight is George Zongolopoulos’ umbrella monument, installed when the city was the European Capital of Culture in 1997. You can decide what the sculpture means, but it’s certainly a popular attraction. There are also several interesting museums worth a visit. The most famous celebrates Archaeology, with a vast array of artifacts from Ancient Greece, but there are other museums dedicated to Byzantine Culture, modern Greek history, and more. If you’re looking for art, the city is packed with galleries; you could spend days just exploring the contemporary art scene. 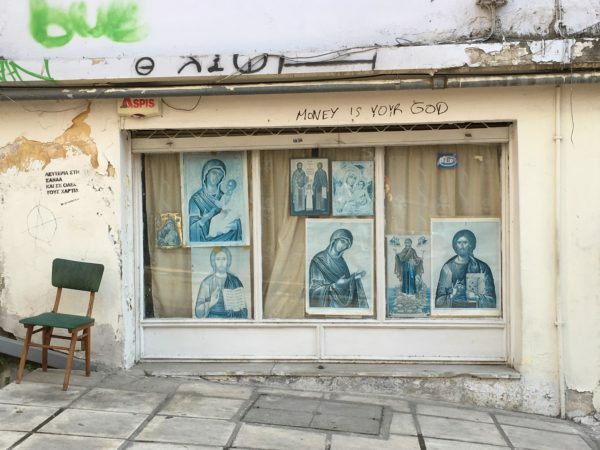 A final recommendation is the Museum of Photography, which is currently hosting a fascinating exhibition detailing the lives and struggles of refugees in Greece. It has a fantastic location (right beside the Contemporary Art Center) at the port, which juts out from the shore, offering a great place to sit and admire the city. 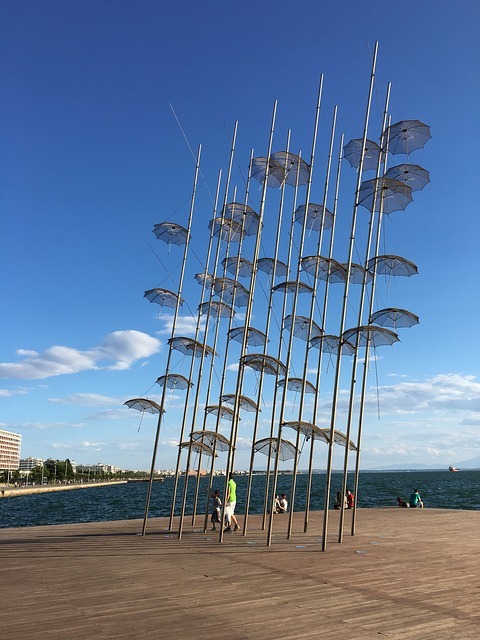 With perfect weather and awesome location, Thessaloniki is one of the best cities in Europe to take a walk. Obviously, the place to be in the seafront. Take a walk along the shore, stopping at the important landmarks: Aristotelian Square, the massive statue of Alexander the Great, and of course the White Tower. That’s not all though: lots of Thessaloniki makes for a great stroll, even if it’s just to admire the interesting graffiti. Make sure to visit the markets, full of colour, noise, and bargains. Modiani is a covered Market right in the centre, while Kapani is its open-air neighbour, just across the road. Thessaloniki probably has the best, or at least the most varied, food in the Balkans. Its position by the sea ensures it has the freshest fish and seafood: order sardines, carp, mussels, calamari or octopus, and you won’t be disappointed. Its not just location that makes the food great though: the rich history of Thessaloniki means multiple cuisines combine. There are strong influences from Turkey, the Middle East, even France. 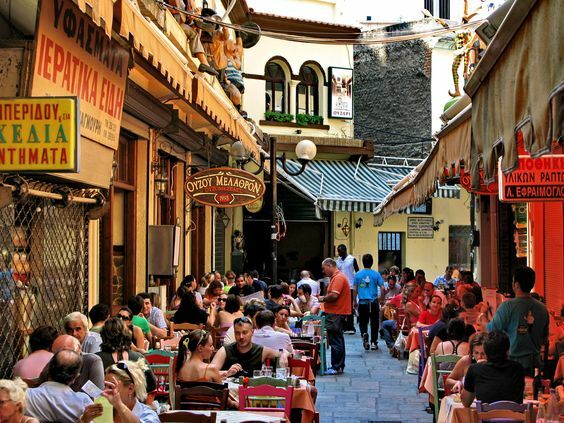 At the same time, you can find the best of Greek food culture: gyros, moussaka, souvlaki. Dishes have a broader range of flavour and sweetness than you might expect; this is the Byzantine influence. Another surprise is the popularity of soup. 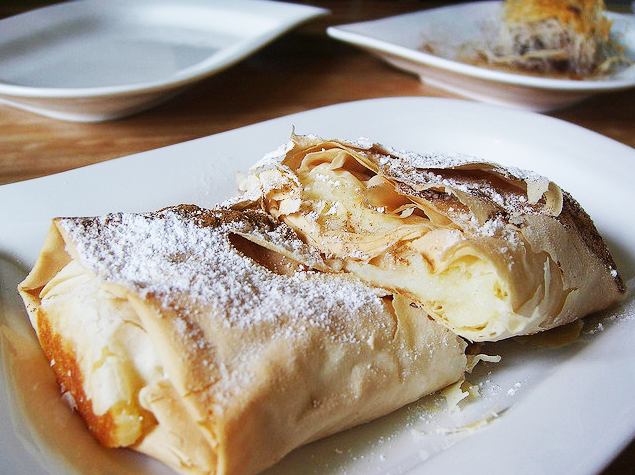 However, if there’s one food that makes Thessaloniki special it’s bougatsa (pictured): this pastry is the ultimate breakfast dish, usually filled with custard, cheese or meat. Thessaloniki is frequently named as one of the best party cities in the world, and for good reason. Whatever kind of night you want to have, there’s somewhere for you. The streets are lined with cafes, packed all day-long and until late in the evening. In the morning you’ll see locals drinking coffee, but if the sun’s out that will soon switch colder, more relaxing, beverages. In the early evening the best place to be is a taverna, for proper Greek food washed down with ouzo. After that, it’s up to you. You can try an old-fashioned ‘bouzoukias’, with live performances of popular Greek music, but you’ll have to reserve a table. Alternatively there are plenty modern bars and nightclubs, with all sorts of music, where you can party till dawn.